I guess I've been gone too long. It looks like more than half of my favorite links are now dead. What happened to all the bloggers? I'll be doing a bit of tidying up over the next week or so, removing old links and hopefully adding some new ones. Feel free to suggest or recommend. 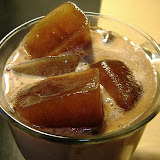 To start, I'd like to draw your attention to this post on FoodBuzz: Chai! Chai!! Koffee! Koffee!! Now, the Koffee Koffee seems to be a mere mention, but the author has two recipes for making your own Chai - a variation on tea that usually doesn't actually involve or include tea leaves. Heh. I decided to start a FoodBuzz account (find me HERE), then I realized that many of my posts were already there on a sort of anonymous account... TWICE. So now I'm there twice, once officially and twice unofficially! lol!! If I could figure out how to claim the unofficial ones I would, but I seem to have gotten dumber over the last year. This is just such a cool concept. It's been done in a variety of ways on the net, via blogs and websites both. Swaps are all over the place. I've seen one where a journal was passed around, eventually traveling all the way around the world. Pretty cool. Bloggers are so inventive, and it still amazes me sometimes how small the internet has made the world. This blog - Knitters Tea Swap 2 (and where, pray tell, is Knitters Tea Swap number ONE???) lets folx sign up and send each other little packages of oh-so-wonderful stuff. I had a great time reading the posts and looking at the pictures of what was in the packages. It was a voyeuristic joy. Sort of like vicarious Christmas. Because it's not just tea - there's cups and biscuits and even chocolate! Of course, a mention must also go to TeaSwap, which has been around for a long time. They're a little more organized, complete with yahoo group, database and all. Here's one for coffee lovers - the Knitter's Coffee Swap. It looks like this one is just starting a swap, I couldn't find any posts or pics of packages. What a great idea though. I wonder, when you ship yarn and coffee beans together, do you end up with a sweater that always smells like coffee? I could live with that. And joy oh joy, here's one for chocolate. And there's pictures and posts and lots of vicarious enjoyment to be had at the Chocolate Swap blog. I wish I had the oomph to be able to participate in something like this. Of course, I don't knit anymore, but I think I would really enjoy the swapping process. At least... heheh... I would enjoy the packages arriving. I remember what a thrill it was when my tea package arrived from the tea fairy. My problem is I'm allergic to the post office. I break out in hives at the thought of going there. If I have to drive by it, I go real fast, and if the light happens to turn red right there, I hold my breath and avert my eyes. Pretty pathetic, huh? I guess I'll just have to enjoy other people's gifts. So keep blogging about your packages folx! Somebody out here is enjoying them with you. A bigfat g'morning to all. I'm slurping my first cuppa, so I'm not entirely coherent yet, but I have a few newsy snippets to share before I go out to play in the yard with my flollies. I'm treating myself to the last of the fresh roasted beans this morning. Color me sneaky and selfish - I'm NOT offering to share, and anyway, the hubs is still sleeping, so there. The early bird gets the good coffee. Speaking of the hubs, the other day he asked me to make him some of the "good coffee". I was busy, so I told him to make it himself. He said he didn't know how, and couldn't use the grinder, whine whine moan moan. Then he went and stood in the kitchen, staring forlornly at the coffee grinder. He stood there for a minute before I realized what he was doing. Just like the dogs when they want to be fed, but having no fingers or thumbs, can't operate the can opener, sit and stare, and wait for somebody to notice that they're hungry. He made me laugh so hard with this image that I took pity on him and did the deed. I'm so easy. Mensa Barbie's World's Finest Lemonade. It's almost hot enough for this now, and it sounds soooo good. D, of Third World County's Egg-Potato-Sausage Whatchacallit. Sounds like another one of those great "feed the hordes" kinds of recipes, good to have on hand when the in-laws show up. In the Headlights' Eggstraordinary Eggplant Parmesan - oh my god this sounds good. For dinner tonight maybe. Since I was unable to post yesterday ... ummmm ... trapped under some heavy furniture, yeah that's it, a big chair fell on me and I couldn't get to the computer... I totally missed reminding everybody how April Fool's Day started. Way back in olden days, when I was young, the French used to celebrate the New Year on March 25. The celebration lasts through April 1st, with dinner parties and family gatherings and present exchanges. People began sending fake gifts on April first which culminated in the grand New Year feast. These gifts were only as a joke on those who previously had received their étrennes or New Year's gifts, on March 25. Poisson d'avril or April fish is the name the French apply to one who is fooled or mocked on April first. Confectioners' windows display chocolate fish on this day and many friends anonymously send each other humorous postcards imprinted with pictures of fish. The French adopted the reformed calendar in 1582 which changed the beginning of the New Year from March 25 to January first. I recommend we all follow the French tradition and send each other chocolate fish! In other news, I somehow made it to Feed of the Day at Feedster! Isn't that just the coolest? Well, I think it is. One year old, I'm one year old! Well folx, the BoB voting goes on, and on ... and on. Apparently until the end of the month! Not only that, but apparently you can vote more than once. I don't really understand a system that lets people vote more than once, but ... whatever. So, if you haven't voted, git over there and vote for your favorite blogs, and for me, of course. And if you already voted, git over there and vote again! The hinky thing is, apparently (uhoh, 3 "apparently's"... must get a thesaurus...) not everybody CAN vote again - there's a fart in the system that they're trying to fix - so some people may be benefitting from multiple voters and some people ... umm ... well ... aren't. Oh what the hell. Please go vote for me, please please, pretty please. I've got a few blogs & websites I've been meaning to add to my sidebar. I'm so far behind in updating my links, it's ridiculous. Boca Java - This small Florida coffee/tea company has been giving coffee to American troops serving overseas. That's all for today. Now go vote! The Best of Blogs voting booth is open. Go have a look-see at all the amazing blogs, and vote for your favorites here. I'm stoked. I'm jazzed. 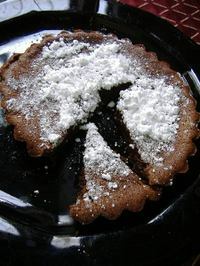 Some kind soul nominated this blog for the Best of Blog awards, in the recipe category! I've never been nominated for anything in my life, let alone make it to the finalists. Let me say that again... I made it to the finalists!!!!! I'm so stoked. I think if I won I'd probably blow up like a balloon and explode, but that's not likely, given the heady (foody) company I'm in there. I don't care, I'm just so stoked to be in the finalists.